One of the amazing tourists place the city of Dehradun is not only famous for the various beautiful locations to enjoy but its also popular for the great markets and shops all around. One would be surprised to see the variety you could get when you are there and moreover the budgeted prices in which you could get the various items is surely cool. Although there are a number of small places all over the city where one can purchase things of all sorts but there are few spots where one would love to go. 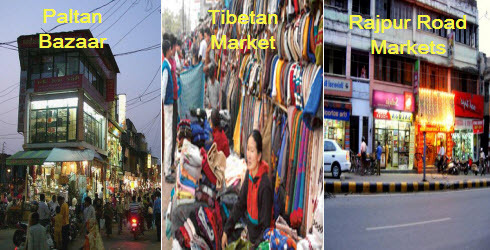 Some of the places where you buy reasonable priced items are the Paltan Bazaar, Tibetan, Indira, Moti and Sunday Markets. If you are moving out for branded ones then the shops at the Rajpur Road would be the best where you would find higher priced but excellent quality products. One of the oldest and the most popular of the shopping places is the Paltan Bazaar situated just at the Ganta Ghar chawk of the main Dehradun city. The place comprises of a number of big and small shops of various cadres where you get the items of any sort right from the clothing, electronic appliances, grocery items, you name it and you will have it all right here. The beauty of the place is that one does not have to go anywhere else if you have come to this spot. Especially the ladies will be excited to find dresses and artificial jewellery items that match all sorts of their need. Another place where one can enjoy buying the various items specially the branded ones is in the shops located all along the Rajpur road. Here you could find all the variety, specially the international ones, if you are looking out for them. There are shops related to saris, suits and jewellery items for women. There are also famous gold and diamond shops at Ashley Hall so if you are free at hand to buy this luxury you should look out for the same. Men can enjoy the markets with their favorite jeans and trousers and do checkout the various brand shops like Reebok, Lee Cooper, Levis, and Cotton County all right here. Also if you are foot wear fanatic do check out the Woodland, Red tape and Reebok brands all right at the same place which you would surely love to wear. The other shopping place which is popular among the people is the Tibetan market. This is situated on road opposite the Pared Ground in the city and is easily commutable even by road as there a number of buses and autos that move through that place. This is the place where you can get relatively cheaper items related to clothing, shoes and varieties of Chinese electronic items. The beauty of the place is that there are a number of small shops with various things so there is variety in the items. The other thing is that you could bargain a lot in these shops so you could get a particular item at much discounted rate if you have a good bargaining tactics! A few steps from the Tibetan Market and the other side of Pared Ground is the popular Indira market that has small shops from where you can buy dresses, clothing and electronic gazettes of cheaper value and often very affordable. Here too you can bargain a lot with the shop keeper and you might get the item at much discounted prices! The narrow shopping street just moves through from one end near Pared Ground and exiting to the other end at the Rajpur road close to the old local bus stand near the Ghanta Ghar of the city. There are shops related to goggles, shoes, belts, pants, shirts, cheap watches, games, cds and lot more things you can think of buying at very reasonable rates. As the name suggests this market is open only on the Sundays. You could enjoy one of the best shopping experiences similar to the Sarojini and Palika shops in Delhi. As one moves across, you would find a huge variety of clothes that at their cheapest price. Although all the clothing material may not be of better quality but you may find quite reasonable items after good amount of searching. There are various cheap items like shoes, belts, pants, shirts, sweaters, over coats and jackets that you could buy at very reasonable cost but off course you have check out its quality. The other place which is popular especially for the furniture and home decor items is the Moti Bazaar which is located at end of Paltan market road when you move more down inside. One can also find handloom shops there where you could get carpets, curtains, bed foams and bed sheets just to name a few. Also one can get bigger appliances like coolers and geysers from the place. The beauty here is that most of the shops are the wholesalers so you can get a good costing per item and right in your budget. If you move on along the Chakrata road then you will come to the Cannaught place market where you could enjoy the shopping at various clothing, mobiles and other items of all kinds. There are also amazing and very old eating places that are quit famous since the olden times of Dehradun. There are also a number of chemists from where you can buy your medicines of all sorts.